Sophisticated and Luxurious High-quality new construction home. Come take a look at this exquisitely crafted row home in one of the hottest neighborhoods in Philadelphia! Walk into this beautiful contemporary new construction, 3-4BD/3BA home with stylish hardwood floors and modern amenities throughout. This modern home features recessed LED lighting throughout, video intercom system, and surround sound speakers in the living room, master suite and roof deck. First floor is open lay-out offering large living and dining area which flows into a marvelous kitchen. Cabinets are crafted with unique workmanship and immaculate transitional design including under mount LED lighting. The kitchen also features high end polished quartz counter tops, custom tile back splash, premium stainless steel appliances, goose neck faucet with double under mount sink, big island, and full glass patio door allowing large influx of natural light. Large windows throughout offer an unprecedented amount of natural light. Custom designed hand forged open iron stair rails and custom handmade wood treads with open riser stairs lead into the second floor. 2nd floor features two large bedrooms, walk in closets with shelving, laundry area with high end Samsung stackable washer and dryer and one full hall bathroom. Third floor houses a luxurious master suite including his & her walk-in closets with shelving, in suite wet bar, and a large master bathroom with custom tiles, frame-less shower doors, soaking tub, and special selected dual vanity. Continue upstairs to find a pilot house leading to a fiberglass roof deck with custom build in pergola where one can enjoy panoramic skyline views. This home also features a full finished basement great for a media room along with a full custom designed bathroom. Rear yard offers a secluded spot for a bbq or for some time out in the sun. 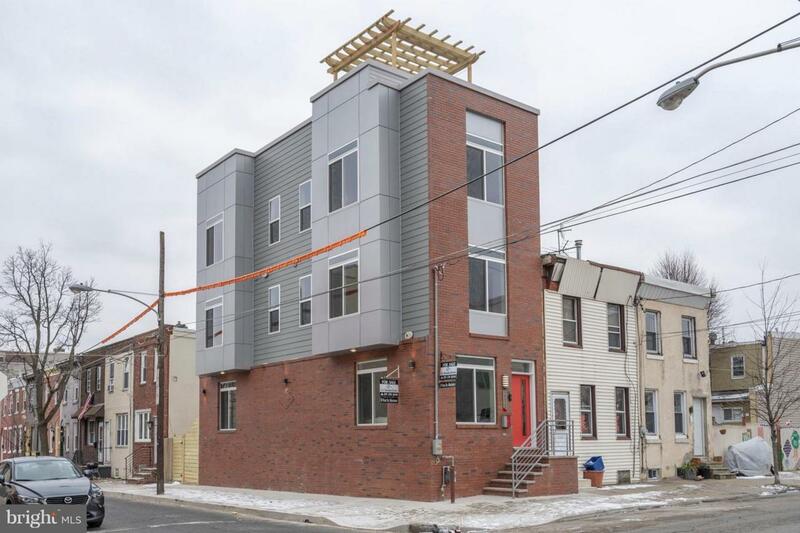 This fabulous location is near all the amenities of Fishtown, few blocks from the community garden, short walk to train Easily accessible to Center City and the rest of Philadelphia via SEPTA's Market-Frankford "El", trendy restaurants & boutiques. On street parking. Easy access to major thoroughfares. Approved 10-year TAX ABATEMENT!